Vegan Stephen: A Vegan, Pre-packaged Starbucks Food? 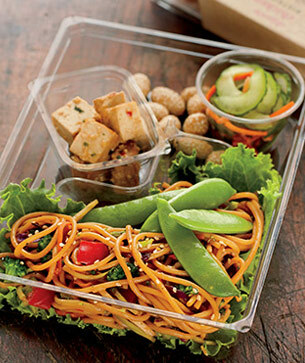 A few months ago I noticed a new product in the Starbucks display case, a "Sesame Noodles Bistro Box." There were other "bistro boxes" from this new product line in the case, but this one grabbed my attention because it wasn't obviously vegan-hostile. It threw a wrench into my daily routine. Typically, I peek in the Starbucks on 2nd Street to see if it's ridiculously crowded. If it is, I walk a diagonal block to the Starbucks on New Montgomery. I usually stand in line for about 2 and a half minutes at the lesser-crowded franchise. I play some Words with Friends while I'm at the tail of the line, but I gradually lose my tenuous connection to the AT&T network as the shortening line draws me deeper inside. When my phone is rendered useless, I turn my attention to the broad array of vegan-hostile baked goods, sandwiches, and pre-packaged nonsense in the display case. This exercise keeps my contempt for Starbucks at a healthy level. It reminds me that I have no affinity for the Starbucks "brand;" it's simply the most efficient source of caffeine available to me in the monotonous system that defines my professional existence. sesame ginger noodle salad (water, broccoli, semolina durum flour [niacin, iron, thiamine mononitrate, riboflavin, folic acid], cucumbers, sugar snap peas, roasted peanuts, carrots, lettuce, red bell pepper, sprouted soybeans, sugar, 2% or less of: cabbage, soybeans, whole wheat, sesame seeds, salt, nigari [magnesium chloride (a natural firming agent), calcium sulfate], wheat flour, sesame oil, ginger, modified cornstarch, xanthan gum, lactic acid, spices, jalapeno peppers, green onions, cilantro, garlic, dried onion, tomato paste, cornstarch, rice vinegar, brown rice syrup, rice wine, vegetable oil [sunflower, palm and/or canola], lime juice, dried orange pulp, extract of mushroom, alcohol [to preserve freshness], sodium benzoate [preservative], guar gum). dark chocolate bar (cacao beans, cane sugar, cocoa butter, soy lecithin [an emulsifier], vanilla). Yet I still haven't tried this product, after all this time. I think that, subconsciously, eating a pre-packaged Starbucks food would be a sort of communion. I would be taking Starbucks inside me in a different way. I'm not sure that I'm ready for that kind of relationship with such a big, powerful corporation. On the other hand, I feel obligated to vote for this product with my consumer dollar. Ok, I'll try it, and I'll post the experience here.